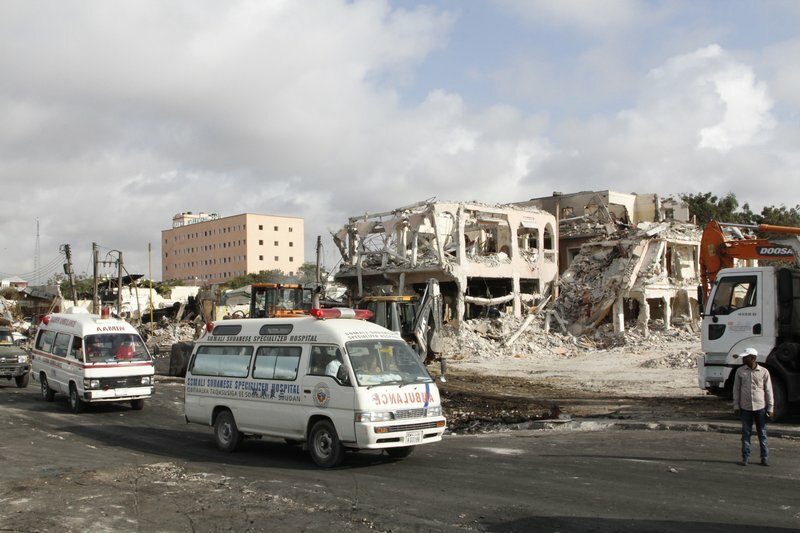 More than 300 people were killed in the weekend truck bombing in Somalia’s capital and scores remained missing, authorities said Monday, as the fragile Horn of Africa nation reeled from one of the world’s worst attacks in years. As funerals continued, the government said the death toll was expected to rise. Nearly 400 people were injured in the bombing Saturday that targeted a crowded street in Mogadishu. Somalia’s government blamed the al-Qaida-linked al-Shabab, though the Islamic extremist group has not claimed responsibility for the attack. A new statement by the SITE Intelligence Group said al-Shabab posted claims of responsibility as recently as Monday for other attacks on Somali and African Union forces — but not for Saturday’s blast. Still, analysts said there was little doubt the Islamic extremist group carried out the bombing, one of the deadliest in sub-Saharan Africa. “No other group in Somalia has the capacity to put together a bomb of this size, in this nature,” said Matt Bryden, a security consultant on the Horn of Africa. Nearly 70 people remained missing, based on accounts from relatives, said police Capt. Mohamed Hussein. He said many bodies were burned to ashes in the attack. As the death toll rose to 302, overwhelmed hospitals in Mogadishu were struggling to treat badly wounded victims, many burned beyond recognition. Exhausted doctors struggled to keep their eyes open as the screams from victims and bereaved families echoed in the halls. Africa’s deadliest Islamic extremist group, al-Shabab has waged war in Somalia for more than a decade, often targeting high-profile areas of the capital. Earlier this year, it vowed to step up attacks after both the Trump administration and Somalia’s recently elected Somali-American president, Mohamed Abdullahi Mohamed, announced new military efforts against the group. After Saturday’s attack, Mohamed declared three days of mourning and joined thousands of people who responded to a plea by hospitals to donate blood. Meanwhile, a Turkish military plane carrying 35 critically wounded people arrived in the Turkish capital, Ankara, where they were taken to hospitals for treatment. 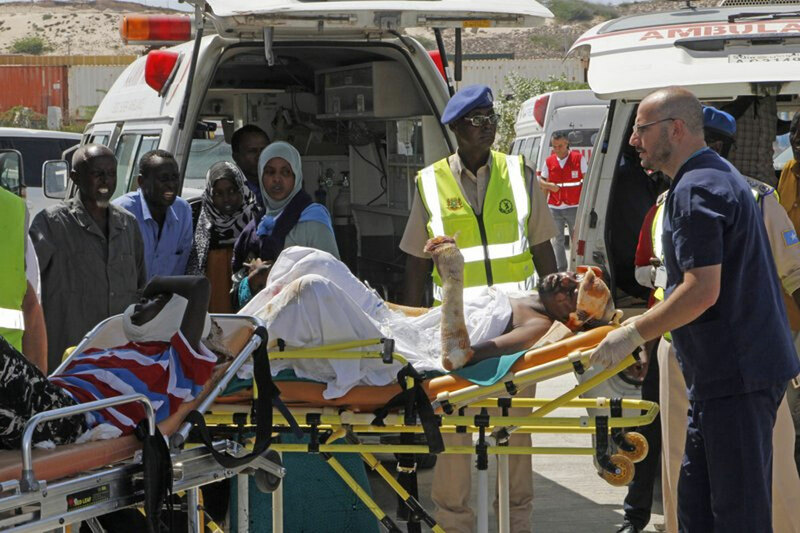 Countries including Kenya and Ethiopia have offered to send medical aid in response to what Somali’s government called a “national disaster,” Information Minister Abdirahman Osman said. A plane carrying a medical team from Djibouti also arrived to evacuate the wounded, according to health ministry official Mohamed Ahmed. The United States condemned the bombing, saying “such cowardly attacks reinvigorate the commitment of the United States to assist our Somali and African Union partners to combat the scourge of terrorism.” It tweeted a photo of its charge d’affaires in Somalia donating blood. But the U.S. Africa Command said U.S. forces had not been asked to provide aid. Pentagon spokesman Col. Robert Manning said Monday the U.S. currently has about 400 troops in Somalia, adding “we’re not going to speculate” about sending more. Somalia truck bombing toll over 300, scores remain missing. The government said the death toll was expected to rise. Nearly 400 people were injured.